If you have read the previous page about Edward Langworthy you will be aware that he was living at Park Crescent, Victoria Park from 1840, (his house there was called ‘Roundwood’ and was next door to Richard Cobden, whose home was called ‘Westerfield’). From about this time onwards and for the next 2-3 years the Victoria Park Company was in financial difficulties and selling off quite large areas of the Park. It is possible therefore that beside the 3 acres Edward Langworthy purchased to build his home, Langdale, on Upper Park Road, he also bought the large plot on the eastern side of Upper Park Road for future investment purposes. 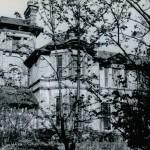 In 1852, six years after he built his home, Langdale, Edward Langworthy engaged Edward Walters to design four houses on this plot of land that could be built for £2000.00 each. 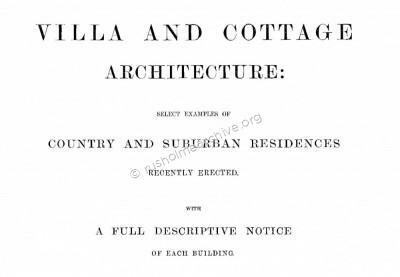 The design, detail and notes about the construction of the houses are taken from a book published in 1856; ‘Villa and cottage architecture’. Select examples of country and suburban residences recently erected. Published by John Blackie. 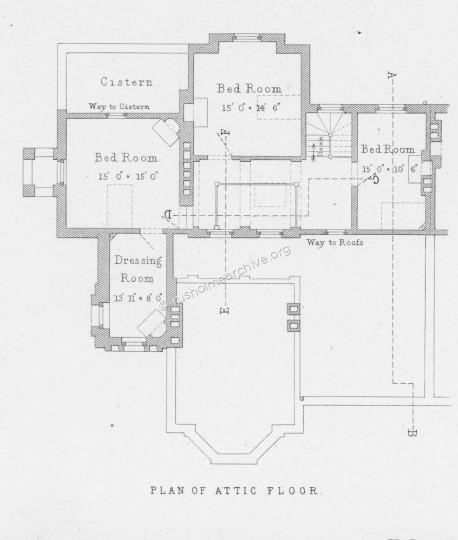 It seemed to the projectors of the VILLA AND COTTAGE ARCHITECTURE that whilst there were certain well-known volumes illustrative of palatial residences, and many others giving minute particulars of the construction of dwellings of the lowest cost and most restricted accommodation, there was a great deficiency of publications supplying examples of houses of intermediate cost, including habitations of several distinct classes. The present Work is devoted to houses of moderate dimensions, or erected at a cost (ascertained in nearly every one of the cases) ranging from £500 to £2500, but including some examples of more expensive character. The examples are selected from widely separated parts of the country, and are the productions of nineteen different architects; and, whilst all have been found suitable to the requirements of domestic comfort, they show considerable diversity in internal arrangements, in the structural treatment of materials, and in decorative character, or style and ornamental detail. All the examples are productions of recent date. The general decorative character of the design accords with that later Italian manner wherein the high-pitched roof began to play an important part; but much of the actual effect of the houses results not only from the grouping of the masses, but, in the details, from the decorative treatment of varied materials; which include moulded brick for some of the string-courses, and wood for the main-cornices, as well as stone for window-dressings and in some other parts. This example in our series is useful as showing that a large amount of accommodation may be provided in a house costing £2000, that is to say, with the prices usual not many years ago. Edward Walters( 1808-1872), is considered one of the eminent Manchester architects of the mid-Victorian period, the others being Alfred Waterhouse, (1830-1905, he practised in Manchester for 12 years before moving to London), Thomas Worthington, (1826-1909) and perhaps Edward Salomons, (1828-1906). 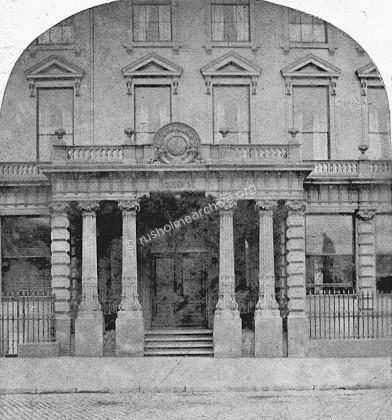 Walters was responsible for a range of warehouses in Manchester, all of which were in an Italian Renaissance Revival style; a particularly fine Congregational Chapel at Castlefield, most notably the Manchester Free Trade Hall & perhaps his most accomplished building was the Manchester & Salford (later William Deacon's) Bank, Mosley Street (1860). He has been described as one of the best provincial architects of the period. “WALTERS, EDWARD (1808–1872), architect, was born in December 1808 at 11 Fenchurch Buildings, London, the residence and office of his father, John Walters, who was also an architect. Walters was educated at Brighton, and shortly after his father's death entered, without articles, the office of Isaac Clarke, one of his father's pupils. Three years' training with Clarke was followed successively by engagements under Thomas Cubitt, Lewis Vulliamy, John Wallen, and finally Sir John Rennie. In March 1832 Walters was sent by Rennie to Constantinople to superintend the erection of a small-arms factory and other works for the Turkish government. At Constantinople he made the acquaintance of W. H. Barlow, engineer to the Midland railway, with whom he subsequently collaborated in various works at home. While in Turkey Walters made plans for a palace for the sultan (never carried out), and at the same time secured the friendship of Richard Cobden, then staying at Constantinople. He left Turkey in 1837, and made a journey through Italy with Barlow. On returning to England he established, on Cobden's advice, a practice in Manchester in 1839. Walters's office in Manchester was at 20 (now 24) Cooper Street. One of his earliest works was a warehouse for Cobden at 16 Mosley Street. After a few unimportant chapel and school commissions, he designed in 1840 Oakwood Hall, a Tudor mansion, for Ormrod Heyworth, and St. Andrew's Free Church at the corner of Grosvenor Square and Oxford Street. It was not till 1851 that Walters was brought into public notice by his design for the warehouse at the angle of Aytoun Street and Portland Street, which initiated the fashion of building Manchester warehouses in the style of the Italian renaissance. Until 1860 he was the leading architect of the town, and erected some fifty buildings, including warehouses, residences, banks, and chapels. 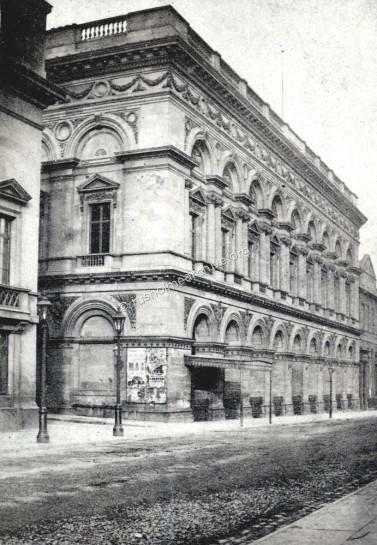 His best and most important works were the Free-Trade Hall (1853) and the Manchester and Salford bank in Mosley Street (1860). Walters's design for the Free-Trade Hall was chosen in a limited competition, and is a fine example of Renaissance work. It cost £25,000, and is considered to have good acoustic properties. In 1860 he joined Barlow in laying out the railway between Ambergate and Manchester, and designed many of the stations, the most successful being those at Bakewell and Miller's Dale. At the bottom of this page there a report taken from the Royal Institute Of British Architects at a meeting in February 1872 when a report regarding the death, (and life and work), of Edward Walters was recorded. As Walter Edwards was a friend of Richard Cobden it is possible that Langworthy was already acquainted with the architect when he commissioned the building of the houses. 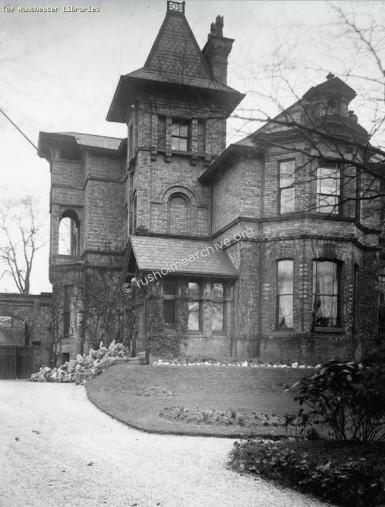 It is interesting to note that whilst the architect of Langdale, (Henry Bowman), left his initials on the property, Edward Langworthy had his initials ERL set into the top of the towers on the new villas opposite his home. 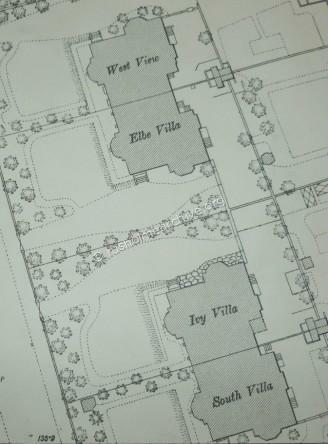 The four villas facing Upper Park Road can be seen on the map below; they were originally named as, (from left to right and facing them), Westview, Elbe, Ivy and Southview. 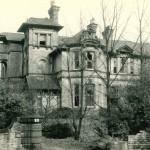 Later at least two of them were re-named, Southview, became Regent House, whilst Ivy Villa was re-named Sherwood House. Looking through the Manchester Census returns and the Rusholme Rate books it is almost inevitable that some of the tenants of the four properties give their occupations as Merchant, and often from Germany. In 1853 one of the family living in one of the villas mentioned in the Rate Book was that of Theodore Merck, a notable German family. Next door is a family from Holland, Henry Salomonson, a merchant who is still a tenant some 12 years later according to the 1865 rate book, with the property rental assessed at £150 per annum. Henry Salomonson then seems to have moved around the Park finally living in Oaklands, (off of Oxford Place), dying there in 1902. 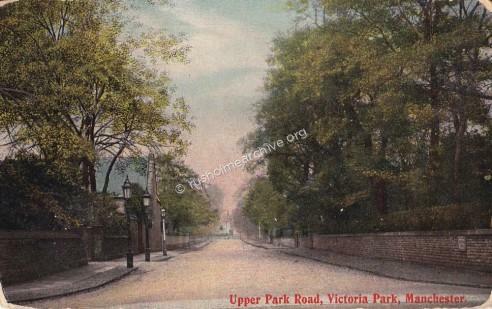 In the postcard view below of Upper Park Road the four villas are on the right-hand side of the road. Emil Liebert was another tenant that remained for nearly 40 years, living in Ivy Villa. 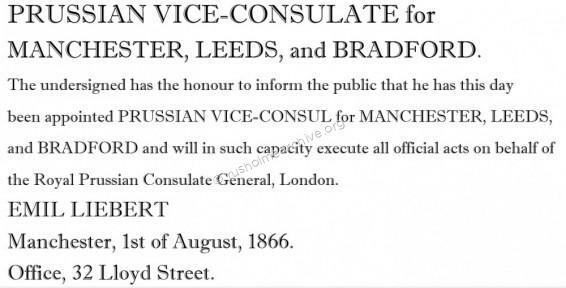 Liebert had arrived in Manchester in 1837 from Prussia at the age of 20 to work in the ‘Manchester Trade’. At this time there were already over 70 German companies in Manchester offices with their principals finding their homes in Cheetham Hill in the north or to the south, Chorlton-on-Medlock, Greenheys or soon in Victoria Park. Emil Liebert was living in 1852 at 61 Upper Brook Street, a house with stables, coach house and garden for a rental of £80 per annum. He remained here until 1860 when the family moved to Ivy Villa and the 1861 census shows him employing four servants to look after his family of five. The Rusholme rate book show the estimated rental in 1865 was £150.00 per annum. The last entry in the Rate Book that specifically identifies the properties as being in the possession of the Langworthy executors is in 1900, after 48 years it certainly must have been a worthwhile investment. Emil Liebert continued to live in Ivy Villa until his death in January 1899, the following is the obituary published in the Manchester Evening News, January 4th. DEATH OF MR EMIL LIEBERT. "The death occurred on New Year’s Eve of Mr. Emil Liebert, who was in his 83rd year. Mr. Emil Liebert was the son of Mr. S. A. Liebert, a well-known Berlin merchant trading in Manchester goods. The firm of Messrs. S. A. Liebert and Company was established in Manchester about the beginning of the century, and when twenty years of age Mr. Emil Liebert, who had been educated in Berlin, came to this city with the object of learning the business. He found the change from German to English life eminently adapted to the development of enlightened and democratic ideas, which received but little encouragement in his own country at that period, and he was not slow to take advantage of the opportunities thus afforded him. 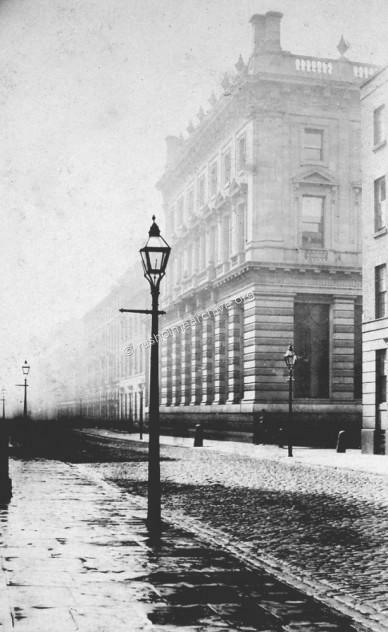 Mr. Liebert and his cousin were eventually appointed Manchester representatives of the firm, and in 1837 the former gentleman became a member of the Royal Exchange to which he has since been a subscriber. For eight years he carried on business in partnership with Mr. Julius Lipmaim, but in 1867 he embarked in an undertaking on his own behalf, and recently has carried it on in partnership with his son in Dolefield, off Bridge Street under the style of E. Liebert and Company. Last year Mr. Liebert, together with Mr. John Chadwick and Mr. John Swanwick, were presented with complimentary life tickets as members of the Royal Exchange in recognition of their long and honourable connection with that institution. Though he has never taken an active part in Manchester political or social life, he held the post of German Consul in this city for many years, and was thus brought into considerable prominence. Upon his retirement from the active duties of the consulate two years ago he was presented by the local German community with a handsome service of silver plate at a banquet given in his honour at the Schiller-Anstalt in Nelson-street. Mr. Liebert held the order of the Prussian Crown, and had also received the order of the Red Eagle from the German Emperor. He took a lively interest in many movements affecting the welfare of German residents in Manchester, and was treasurer of the Society for the Relief of Distressed Foreigners. He had also held a similar position in connection with the German Library, formerly in St. Ann’s Square, but now in Bridge-street, and was president and a warm supporter of the Schiller-Anstalt". If you would like to read more about the German community in Manchester there is an excellent paper published by The Manchester Centre for Regional History at Manchester Metropolitan University. I have found a copy on the Wayback machine, written by Su Coates it is entitled, “Manchester’s German Gentlemen: Immigrant Institutions in a Provincial City 1840-1920”, to download the paper in PDF format click below. So now you can read the following notes written by Edward Walters about the design and construction of a house that suited a successful German merchant and Vice-Consul. He was not in the same wealthy sphere as his landlord, Edward Langworthy, but nevertheless Emil Liebert did leave £49,000.00. 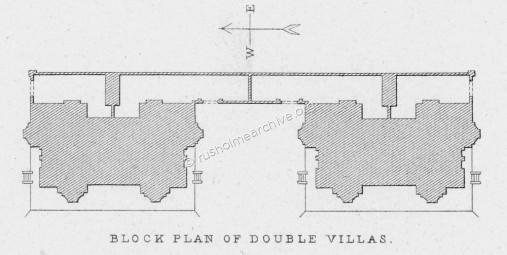 "Although the title of these plates, like the front-elevation in the first of them, refers to only two houses, the design and work of the architect includes four houses; of which the arrangement is explained by the block-plan in Plate LXXVII. This plan shows that there are two similar masses, connected in the rear by a screen-wall. Each half of the entire group, or each double-villa, is the exact counterpart of the other; and each house is a counterpart of that to which it is attached, only that the plans are reversed, excepting that there is a slight difference in certain fire-places in the party-wall, and another in the position of the entrance-gateways to the court-yards. 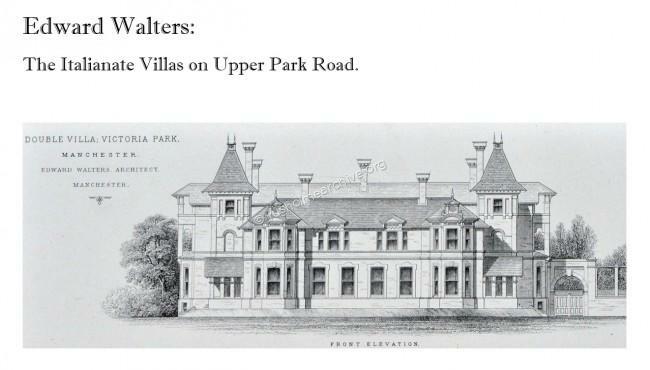 The houses were erected in the year 1852, in Victoria Park, which is in one of the southern suburbs of Manchester. The locality is rather flat, and without any extensive prospect. The principal front of the four houses is to the west. The general decorative character of the design accords with that later Italian manner wherein the high-pitched roof began to play an important part; but much of the actual effect of the houses results not only from the grouping of the masses, but, in the details, from the decorative treatment of varied materials; which include moulded brick for some of the string-courses, and wood for the main-cornices, as well as stone for window-dressings and in some other parts. This example in our series is useful as showing that a large amount of accommodation may be provided in a house costing £2000, that is to say, with the prices usual not many years ago." "Each of these four houses occupies an area, on the ground, that may be roughly set down as about 53 feet square; and each has three storeys, including the underground-basement, in the front of the house, and four storeys at the back, as well as at that portion of the plan which is carried up as a tower. 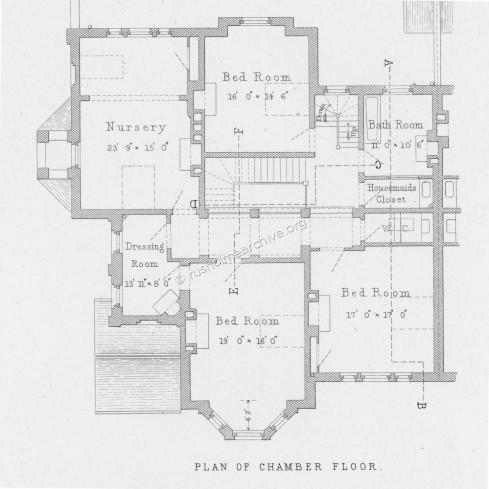 There are three day-rooms, or reception-rooms; and there are rooms in the upper-floors, capable of providing for eight beds (two being in the nursery): added to which are two dressing-rooms, each partly in the tower, and a bath-room. All the bed-rooms, including those of the attic-floor, are good rooms. The staircase is a noteworthy feature, being effective and large for the size of the house, and running round three sides of a parallelogram on plan. The front- and back-entrances to the house are so disposed, and shut off, that there is no draught from one to the other, as there often is in semi-detached houses. GROUND FLOOR. "The principal entrance to the house is placed, well sheltered within an open porch, at the end of the block of building. The door is at right angles with the entrance to the porch itself; which latter is reached from a grass-terrace, to which there is a flight of steps of ascent. The entrance leads into a side-lighted hall, which has a fireplace; and from the hall lead out the door of the morning-room, and the way into the staircase-hall, whence lead out the doors of the drawing-room, dining-room, and offices. 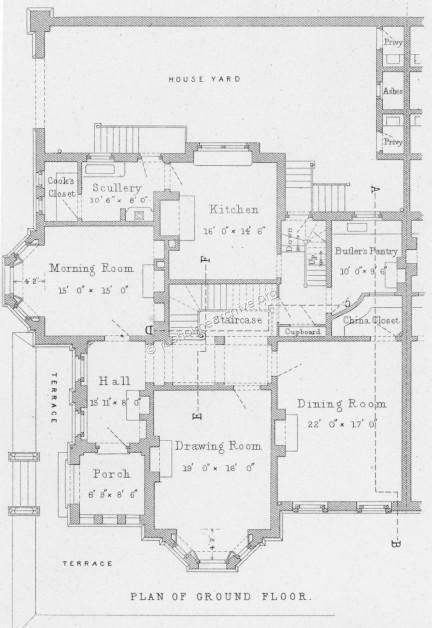 The morning-room and the drawing-room have bow-windows, semi-octagonal, and, as regards this storey, very similar to one another; but the projection from the drawing-room is carried up to the storey above; whereby there is produced a very marked feature in the elevation; whilst a different termination is given to the composition in the other case. The dining-room and drawing-room look, both to the road in front of the houses. Attached to the dining-room is a china-closet, having a borrowed light from the butler's pantry. The arrangements of the shutters to the windows of the principal rooms of this house deserve attention, especially as they are part and parcel with the external effect produced by breaks and projections. The shutters, in boxings, are so contrived as to project little, if at all, into the room: the boxings are inserted in what may be considered the thickness of the wall; whilst in the case of the bow-windows they are so planned, as to their splays, that there is the least possible obstruction to the light entering, and the least heaviness of appearance in the room. 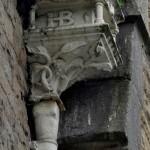 These features of the houses are shown to an enlarged scale on Plate LXXVII. The way to the offices, from the hall, leads into a space in which are the back-stairs, and the doors of the kitchen, the pantry, the main back-entrance of the house, (the last-named down three steps,) and the way down to the basement. Here also is a cupboard. Leading out from the kitchen is a scullery, with a cook's closet attached; and from the scullery there is another way out to the backyard of the house. This description shows that almost all requisites of a house for a large family of the middle-class are provided, and at an outlay that was small. But everything could not be furnished for £2000. What the house most requires, in the opinion of its architect, is a servants hall. The omission, so to call it, is sought to be remedied by a hot-plate, which there is in the scullery, for summer-use. It is placed behind the kitchen-grate, and relieves the kitchen somewhat from heat of cooking. The height in the clear, on this floor, of the principal rooms, is 11 feet 3 inches; whilst the height in the case of the offices is 10 feet 2 inches. 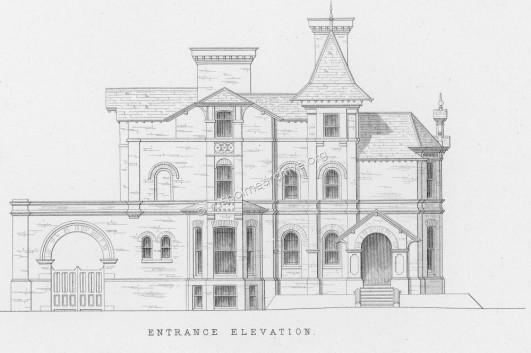 The principal staircase is shown separately, by two sections; which will greatly assist comprehension of the relation between the upper storeys and the lower. It is lighted partly from the top, and partly by two side-windows in the attic-storey. The yard has a large archway of entrance to it, with folding-gates. In the yard are various conveniences." PRINCIPAL CHAMBER FLOOR. "The principal stairs from the ground-floor lead up to a landing, which may be considered to form part of that of the back-stairs; and from it open the doors of one of the bedrooms, the bath-room, and the housemaid's closet. Thence, two steps lead up to the floor-level of the principal bed-rooms. These rooms, including the nursery, which is for two beds, are four in number, one of the four having a dressing-room attached. The bed-room last referred to could be the principal one of the house; and the nursery is close to it. The nursery has one of its windows opening into an external loggia, or balcony. These different rooms are connected by an arcaded corridor, similar to one in the storey below, and railed in by a wooden balustrade. At one end of the corridor is a wc, which is lighted from the roof. The housemaid's closet has a borrowed light from the bath-room. The rooms on this floor are, the front rooms, 11 feet in the clear height, and the back rooms, about 10 feet 4 inches." ATTIC STOREY. "This is reached by the back-stairs. They communicate with a balustraded passage-way that goes round three sides of the hall of the principal staircase. It gives access to three bed-rooms; out of one of which leads a dressing-room. This bedroom, which is two steps up, has one of its windows with a loggia, as in the nursery below: the other window affords a way to the principal cistern of the house, which is over a portion of the nursery. A way out on to the roof of the front-portion of the building, also, is provided from the attics." BASEMENT. "The underground-storey is indicated in the principal section. It contains the places for storage of coals, beer, and wine, and a larder. The cellars are from 7 feet 8 inches to 7 feet 11 inches in the clear height. There is an entrance into the cellars, from the yard, under the back-entrance of the ground-floor. The external walls of these houses are of the "common" red-bricks of the locality, with facings of fire-brick. The base-mouldings and strings are formed of the latter description of brick, cast to the form required. The fire-bricks were obtained in the neighbourhood. The sills, the architraves, and consoles to such of the windows as have these features, along with the carved trusses to the pediments of the bay-windows, the mouldings forming part with the sills of the windows of the principal chamber-floor, the fasciae and moulding forming the lower division of the entablature-cornice of the building, and the scroll-supports to the terminal feature of the bay-window, are all of Yorkshire stone, polished." "All the crowning-mouldings of eaves, or cornices, of the entire building the porch, and the bay-window in the entrance-front; the cornices of the pediments of the other front, and the cantilevers to different overhanging-eaves, are of wood. Part of the decorative effect, as in window-heads, is produced by corbelling the brickwork, and by the introduction of diagonally-set bricks in panels. The external walls are built 13 inches in thickness, excepting in the case of the basement, where they are 16 inches, including a cavity (2") to prevent the passage of damp. A course of 3-inch York-paving prevents the rise of damp, in the walls, from the ground below. Where the external walls span wide openings, as in the case of the bay-windows, and where the large cistern occurs, they are carried by iron-girders. The heads, of the three-light windows of the upper storey, also, are formed with iron lintels; whilst the windows of the tower have iron plates (1-inch metal) carrying the brickwork. To each of the gateways there is a strip of 4fbs lead in the brick-work, or covering the extrados of the arch. The internal partition-walls are of common brickwork of 9 inches thick-ness, excepting where support below was wanting: in these latter cases the ordinary partitions, lathed and plastered on timber-quartering, are used. The material used in the carpenter's work and external joiner's work, is the best "crown" Baltic timber. The internal joiner's work is of St. John pine. The joists are strutted by two rows of herring-bone strutting, with, ordinarily, an iron bolt (1 inch), additional, to each room." "All the windows have sashes, double-hung, in deal-cased frames. The shutters have already been referred to. 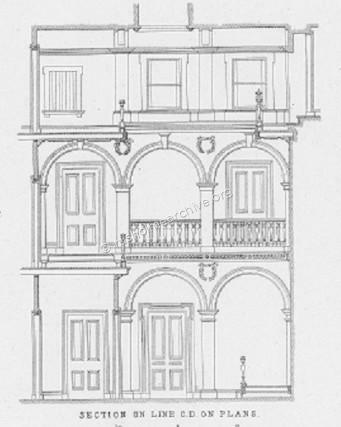 The cornice of the room is carried round the recess of the bay-window, which is flanked by pilasters; and above the window there is an enriched frieze, behind which is a space that may serve as a blind-box, or for the pole for the curtains, in lieu of the ordinary cornice-pole concealing a portion of the architecture of the room, and usually destructive of harmony. The "Windows of the principal rooms and the hall, and those of the bedrooms in the front of the house, are glazed with plate-glass. The back-windows of the house have 16 oz. sheet-glass; and all the other windows have 26 oz. sheet-glass, of Chance's make. The roofs, arranged as shown in the plates, are covered with Welsh slates, the hips and ridges having rebated ridge-tiles, and the valleys and gutters being lined with lead. The high-pitched capping of the tower is finished with a cresting in galvanized iron, presenting a monogram of the letters E. R. L. those of the proprietor of the buildings. 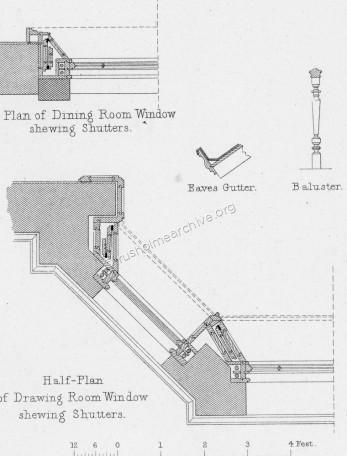 The gutters, with one exception that is shown in the transverse-section of the staircase, are on the eaves; and the simple arrangement of these is explained by a separate detail-figure in Plate LXXVII. The down-pipes, however, wherever they would interfere with effect of the fronts, are placed internally. Their positions are indicated in the plans, although, of necessity, slightly. The total cost of the four houses was about £8000, exclusive of screen-and garden-walling. 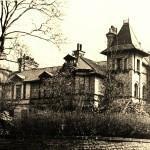 Thus each house may be said to have been built for the sum already mentioned, £2000." Sadly the properties were all demolished in the early 1970’s, perhaps if they had been larger they may have been used, (as other houses in the Park) for some institutional use. The plot on the left has been replaced by a Mosque and on the right plot a very indifferent block of flats. The three photographs below (kindly loaned by Peter Helm) illustrate the decline of the houses. In the south-east corner of the site with access from Denison Road is what I have always presumed to be the stable block and grooms cottage for the villa called Southview. This still remains and is a private residence – a mews cottage designed by Edward Walters, now that is special! To end this page the final photograph below, probably of Ivy Villa in 1885, is displayed by kind permission of the Manchester Central library Images collection (m40561); perhaps this photograph is the best to remember how a home ‘suitable for a German Vice-Consul’ looked at its best. Mr. E. P Anson, Vice-President, said: Gentlemen, I claim the sad privilege, as a near relation of a late able architect, to give in this meeting of his professional brethren, a brief notice of his recent and premature death, and of his professional life.
" Died, at Brighton, Edward Walters, late of Manchester, in the 64th year of his life." Edward Walters was, in the locality in which he practised, well-known—he was a distinguished architect and an honourable man—he was the author of works of great merit and public importance in Manchester, and in surrounding districts. You will not therefore, I trust, feel it amiss, before the ordinary business of the evening commences, that I should give a short notice of his career. He was the son of an architect practising in London, whose professional career was prematurely terminated by death. His father was in the office of Daniel Alexander, where were with him my own father, James Savage, John Wallen, Ashpitel the elder, Whichcord the elder, Busby, and Richard Suter—all of whom, except the last named, have now been removed from the scene of their earthly labours. to Constantinople, as architect to the Small Arms Factory, which Mr. Rennie built for the Sultan of Turkey. There he formed, before he left in 1836, the acquaintance of that enlightened statesman, Richard Cobden, who, whilst visiting Constantinople, was taken ill, and having asked for the company of some resident Englishman, Walters kindly tended him in his illness, and thus originated a friendship which lasted until Cobden's death. Cobden invited him to Manchester when his engagement with Mr. Ronnie ceased—an invitation of which he availed himself, and was almost immediately introduced into some professional work by his friend. He came to Manchester just at the time when Lane was retiring from practice, but notwithstanding all that his kind and influential patron could do, he had the inevitable struggle of an unknown man venturing into a strange land. In due time, however, his pleasing personal appearance and manner, his high integrity and sense of honour, his ability and unwearied industry enabled him to achieve the distinguished reputation which for many years he enjoyed in Manchester. One of his first important works was Mr. Brown's Warehouse, in Portland Street, and amongst his other works are the Free Trade Hall, Manchester, and Salford, Cavendish Street Chapel and Schools, Knot-Mill Chapel, Bank in Mosley Street, Manchester. On the walls are specimens of his drawings, all his own work, but he was assisted in them by his friend Mr. William Wild, an eminent English artist, residing in Paris, particularly in the backgrounds. His last important work was the Assize Courts competition at Manchester, subsequent to which he relinquished his business in favour of his pupils. He was not a member of this Institute, and was of a very shy and retiring disposition. He remained unmarried throughout his life, and mixed little with his professional brethren. He had very warm friends in Cobden, the Agnews, W. H. Barlow, C.E., and others.